By Garstin & Co. Ltd. First World War Verners Pattern MK VII British Marching Compass dated 1917. Solid brass case approximately 55mm diameter. Hinged upper bezel/lid with centre glass and sighting line. Hinged foresight. Engraved to the side with compass bearings and has a rotating bezel and brass button to lock the rotor/dial. This compass has the less common black painted embossed aluminium dial. Engraved to the base with War Department broad arrow, serial number and 1917 date. With original leather case bearing manufacturer's marks and owner's name. The blued finish of the upper part of the compass is worn but it remains in good working order and is damage free. The case is in sound condition but shows use and wear and the end of the buckled securing strap is absent. 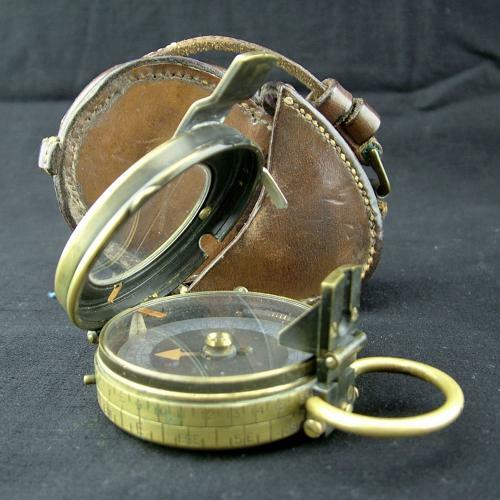 The compass belonged to 2nd Lieutenant S. Symonds and comes with a typed copy of a letter written his wife. It was sent from his ward at the 20th General Hospital, British Expeditionary Force, France on Armistice day, 11th November 1918. Purchased from a family who lived near Symonds's daughter and 'kept an eye on her' until she moved into a home in Bognor at the age of 91. An interesting piece with history. Stock code M23248.